Mini (4 oz. ): Mix entire container with 28 oz. water (in 32 oz. spray bottle). Hipster (12 oz. ): Mix entire container with 1 gal. water (in 1 or 2 gal. garden sprayer). The King (1 gal. ): Mix entire container with 10 gal. water, or use as needed in smaller amounts. Preparation: Cut grass to desired length. Do not spray color on grass that is wet, or if rain is in the immediate forecast. Do not spray when conditions are windy. Shake bottle/jar for at least one minute, or until contents are uniform. 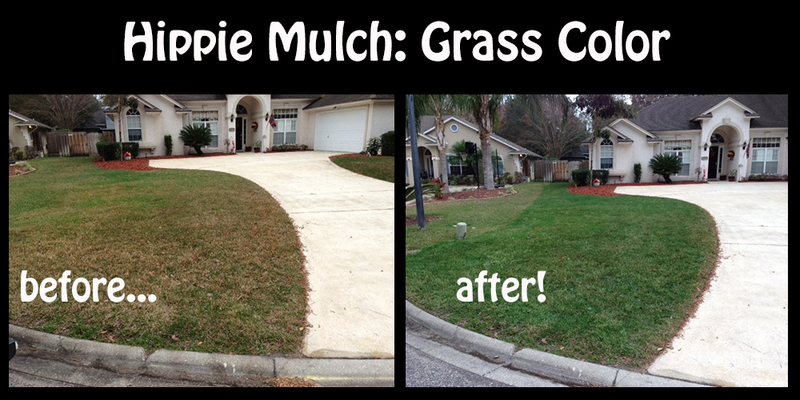 Pour Hippie Mulch Grass Color into sprayer and add the appropriate amount of water. Cap sprayer tightly, and shake for 30 seconds. This will allow the color to be evenly distributed throughout the water for consistent coverage. Keeping the sprayer nozzle 6-12 inches over the surface, extend arm and spray grass while moving arm in a back and forth motion for complete coverage. Shake the sprayer periodically during application to ensure an even distribution of color. Always start in the far end and work backwards to avoid walking in the Hippie Mulch Grass Color unnecessarily. Hippie Mulch Grass Color usually dries in just a few hours but is weather dependent, so it is recommended to allow it to dry overnight. When you are finished spraying your grass, always clean out your sprayer outdoors in the grass. Refill sprayer with water, and continue to spray in order to completely clean out contents. Do not store unused color and water in the sprayer, as it can clog the sprayer. Once Hippie Mulch Grass Color is applied and dried, it is completely safe for people, pets, plants, and the environment. No worries. Like all colorants, Hippie Mulch Grass Color can stain clothing, so wear older clothes when applying. Do not spray color on grass that is wet, or if rain is in the immediate forecast. Do not spray when conditions are windy. Do not apply if air temperature is below 40 degrees F. To avoid overspray on buildings, plants and sidewalks, use a large piece of cardboard or similar material to shield and protect items you do not want to color. Do not spray the freshly colored grass directly with water as it can lose its color. For stubborn stains that were not rinsed off immediately and have set, use soap, water, and a brush to remove. Hippie Mulch Grass Color has a shelf life of 9 months in the jar or bottle. Do not allow color to freeze. Color lasts up to 3 months. 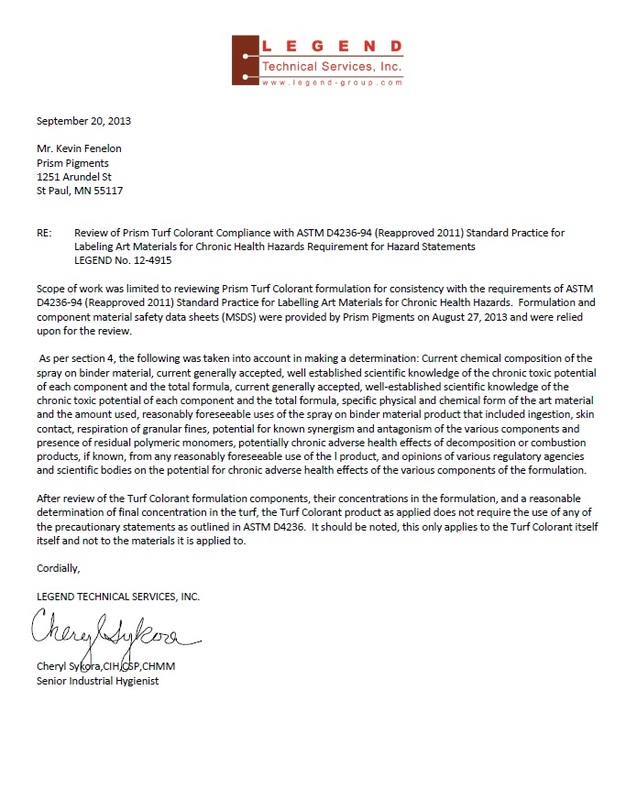 Safety Info: Once dry, Hippie Mulch Grass Color is completely safe for kids, pets, plants, and the environment, as certified by Legend Technical Services, Inc., an independent technical laboratory specializing in environmental testing. Attached is the original report.